When The WB and UPN merged to become the poorly acronymed The CW, any sort of identity The WB once had was irretrievably lost, replaced by shiny, flashy, shallow shows in some sort of desperate attempt to boost the network’s “cool” factor. 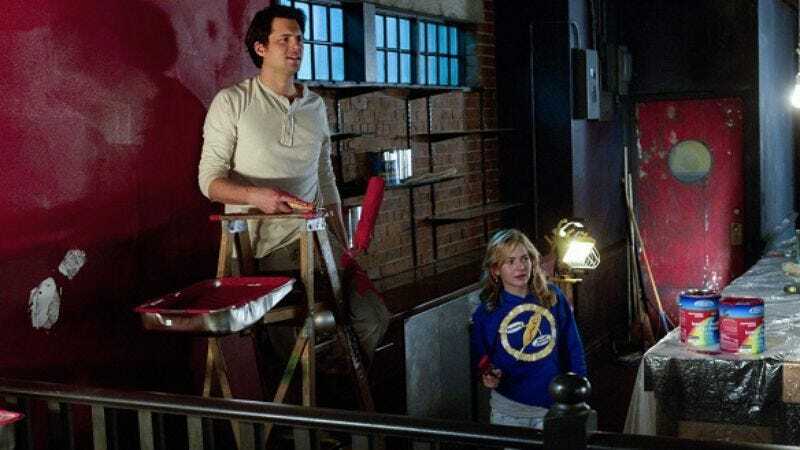 Whether this worked or not is debatable, but when Life Unexpected showed up on the scene last year, looking and sounding exactly like something from the glory days of the forgotten WB, I took notice. What started in the first season as a flawed yet interesting show about family dynamics and the choices people make, however, quickly devolved in season two to all-out soap mayhem, complete with a student/teacher affair, surprise pregnancies (yes, more than one! ), braining by shovel, revelations of past child abuse, father and son sleeping with the same woman, and overly dramatic bar fires. To be fair, Life Unexpected has always had its roots firmly planted in soap opera soil. The basic premise (high school nerd Cate has one-night stand with Big Man on Campus Baze, Cate gets pregnant and gives child Lux up for adoption, Lux shows up on their doorsteps 16 years later, and a makeshift family is formed) is, frankly, ridiculous. However, the first season mostly managed to find the small dramas within this big ball of melodrama and craft those small dramas into realistic, moving character moments. The question of what someone would do if thrust into being the parent of a screwed-up teenager is not necessarily a new one, but it has plenty of avenues to explore, and for the most part, the show did it well. The problem with season one, though? Ratings. The CW, generally being in the ratings toilet as it is, could afford to renew a low rated show with a semi-passionate fan base, but it couldn’t afford to let the ratings stay where they were. So the network interference began, with the main directive being to expand the universe of the show (according to producers). The universe expanded, yes, but in ways that appeared to be against everything the producers were attempting to do in the first season. Small moments gave way to big, soapy plotlines. The story of Lux dating her teacher was particularly problematic, especially since, until the finale, it was played mostly for romance and not for the creepy, predatory relationship it is. Amongst all of the various plot machinations it attempted to juggle, the show seemed to lose its characters, which were its greatest assets. As for the finale itself, it was obviously originally conceived as a season, not series, finale. The final two hours wrapped up the Lux/teacher relationship and gave all of the characters somewhere to go in the future but not in any sort of final way. For the first hour and 50 minutes, it wasn’t that terrible. A bit boring, a bit uninspired, perhaps, but not terrible. It seems the producers must have been given time to craft some sort of a series ending last-minute, though, because there was a "two years later" coda, which shall forever be known as the “WTF, Happy Endings for Everyone!” coda. It didn’t matter if it made sense; if the fans wanted it even a little tiny bit, then the producers delivered. Cate and Baze? Together! Is Cate’s current husband Ryan upset about this? No, because he’s married to his random ex-girlfriend/baby mama whom we’ve met once! On top of it all, Lux is now dating her best friend’s boyfriend, and her best friend is totally fine with this! Boyfriends for EVERYONE! (Well, except for that best friend. She’s totally screwed.) Plus, tertiary characters are paired off in a way that would be mind-blowing, if anyone cared about those characters in the first place. The whole thing is fan service for the sake of fan service, with no attention to character, and is fully representative of the very deep rabbit hole of nonsense that season two fell into. This is not to mention the finale's uncomfortable implication that romantic happiness is the only happiness worth striving for, but I’ll just leave that one alone because it is far too deep a concept for this show to grasp. In the end, there’s not much more to say about Life Unexpected. It came, it showed promise, it squandered that promise in pursuit of ratings, and it ultimately failed miserably. I suppose there are worse things a television show could be. I mean, it could be Hellcats. The main three actors (Kristoffer Polaha, Shiri Appleby and Britt Robertson) were quite the winning cast and did their best to make season two work. Polaha, in particular, really stood out. He has an overall deal with CBS now. Here’s hoping he doesn’t become The Mentalist: San Antonio or something equally horrifying. One redeeming quality of the show in regards to the student/teacher relationship: All of the other teens who find out about Lux’s inappropriate teacher touching constantly tell her how gross it is. Lux’s friends are way smarter than Lux. Lux, by the way, seems to be valedictorian in the “WTF, Happy Endings for Everyone!” coda. Um, no. Just no. I just need to reiterate: One time, this season, a teenage girl hit a guy over the head with a shovel. I had to mention that again, because it was fantastic in its awfulness. Shovel! The CW’s promo team is apparently still calling this a “season finale,” but the producers and cast have all confirmed it is pretty much over. The “two years later” coda also puts the nail in the coffin a bit, don’t you think, CW? Ah, Cate is afflicted with the magic “barren woman” soap syndrome. Because the most shameful thing you can do as a female is not be able to bring children into the world.